In the world of TGI Fridays, apps aren’t something you download to your phone, but a giant plate of something you order before your equally giant meal. TGI Fridays’ potato skins appetizers are so legendary, they have their own grocery-store frozen version and their own bagged snack: TGI Fridays Potato Skins Snack Chips. Seems pretty obvious that the potato skins snacks are not actual potatoes dripping with real sour cream and chives, right? Apparently not. 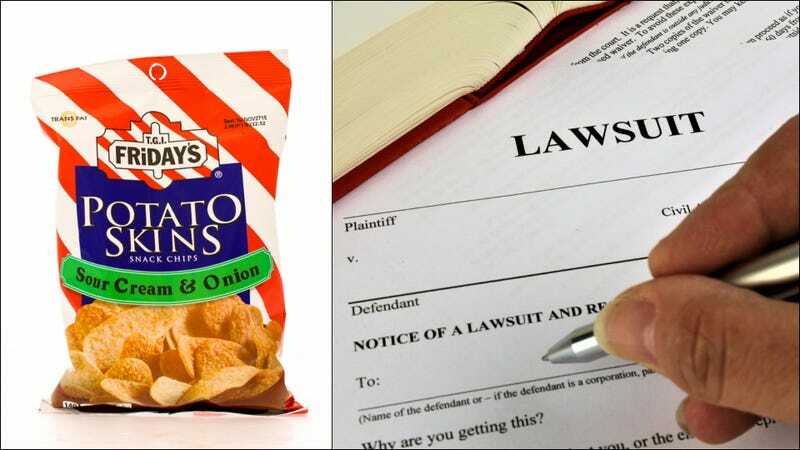 A Bronx woman is now suing the company, saying that TGI Fridays Potato Skins Snack Chips are not actually potato skins. We believe a “well, duh” is well-earned here. In related news, Flamin’ Hot Cheetos are not actually on fire. This nutrition listing includes “dehydrated potatoes” as an ingredient, not stipulating what particular part of the potato. So far, TGI Fridays has not responded to the lawsuit. Followup question: Did the woman use the bathroom at the bodega where she bought the chips? Stephen Colbert admits that the first six months of his Late Show were "terrible"